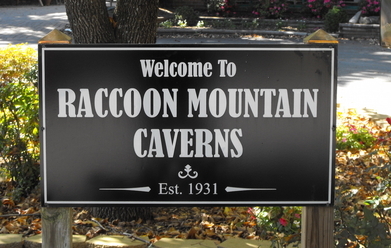 Raccoon Mountain Caverns, Raccoon Mountain Caverns Wild Cave Expeditions - Chattanooga, TN Chattanooga, TN F.A.Q. Welcome to the Frequently Asked Questions (FAQ page). Below, we have provided answers to the most common questions our visitors have regarding our Wild Cave Expeditions. If you find that your question is not answered on this page, please e-mail us at cave1@rvcoutdoors.com or call us at 423-821-9403, ext. 1. Q: What is included with a Wild Cave Expedition? A: We provide you with a safety helmet, headlamp, knee pads, gloves, and a highly trained, knowledgeable guide. Q: How do I know if a Wild Cave Expedition is right for me? A: Wild Cave Expeditions are physically strenuous tours that require strength and stamina. Tours include climbing, crawling, walking, stooping, and sliding. These tours visit the undeveloped parts of the cave, which include many small spaces and a total lack of light. Therefore, they are not recommended for those with claustrophobia or achluophobia. These tours are also not recommended for those with back, neck, heart, or knee issues or those having had recent surgery or who are pregnant. Casts are not permitted on Wild Cave tours. A: Height, age, and weight restrictions apply for all Wild Cave tours (see the Expeditions page for more information). Guests must meet these requirements in order to participate. A: For those with an adventurous spirit, Wild Cave Expeditions offer an unrivaled experience visiting an underground landscape unlike any other. Participants have the chance to see cave formations, waterfalls, wildlife, and more. Our guides work to ensure all participants have a memorable and enjoyable adventure. Q: What size groups can participate in Wild Cave Expeditions? A: Wild Cave tours require a minimum of 2 participants to run. For single visitors, please call: we may be able to add you on to an already scheduled tour. A: Some tours are available for larger groups. Group rate pricing is available for organized groups like schools, scouts, churches, and camps with at least 16 participants. See the Group Expeditions page for more information. 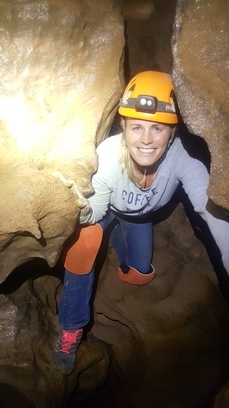 Q: My kids want to do a Wild Cave tour but I don't; can I send them without me? A: Any individual under the age of 18 must be accompanied by a parent, guardian, or chaperone on all cave tours. A: Wear long pants. Blue jeans work well, but coveralls, overalls, or work pants are acceptable. Avoid anything with an elastic waist as they tend to tear or be pulled down (or even off) when belly crawling. Shorts are not permitted! A: Wear either a long-sleeved T-shirt or a short-sleeved T-shirt with a long-sleeved flannel shirt over it. Sweat shirts and jackets tend to be too hot. Please remember that, even though the cave is always 58 degrees, you can get hot and even break a light sweat during the crawls. Short-sleeved shirts are not permitted! 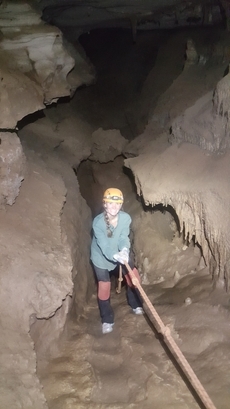 A: Sturdy, lace-up, close-toed shoes are a requirement for all Wild Cave tours. We strongly recommend hiking boots. Open-toed and slip-on shoes are not permitted. No exceptions! *We recommend bringing a full change of clothes as you will get dirty. Q: What can I bring in the cave? A: Your guide will have everything you need. We recommend bringing nothing but an adventurous spirit. Keep in mind anything brought into the cave is at risk of loss or damage. A: Cameras are permitted, but must be able to be stored in a pocket or helmet mounted, not hand-held. Guests are not permitted to take continuous video of their tour. While we allow photo-stops, tours are on a schedule and cannot allow constant or prolonged stopping. A: Food and beverages are not permitted in the cave. Q: Are restroom facilities available during the tour? A: There are no restroom facilities inside the cave. Fees apply for accidents occurring while in the cave. Please use the restroom before beginning your tour! Q: Can I shower after my tour? A: Wild Cave participants are welcome to use our on-site bathhouse to shower. Large groups are asked to keep showers as short as possible to minimize waiting times. Group leaders are asked to supervise their group and to make sure that there is no horseplay and that the facilities are not damaged. These facilities are shared with the campground, so guests are asked to be respectful and not leave excessive mess behind. Q: What if my group size changes? A: Please notify us immediately. If you intend to bring more participants than you reserved for, there is no guarantee that we can accommodate them, as space on tours is limited. With advanced notice, we will do our best to fit them if there is space. There are no refunds for participants that do not arrive for the tour. In order for organized groups to receive group rate pricing, your group must have at least 16 participants. If you drop to fewer than 16 after booking, you have the option to reschedule. Q: What happens if I will arrive late to my tour? A: Please notify us immediately. Tours are on a set schedule and cannot always be adjusted. With advanced notice, you may be able to reschedule your tour. We do reserve the right to cancel trips for late arrivals (see cancellation policy below). A: Payment is due in full when reserving a tour. There are no cancellations or refunds. If you fail to arrive for your tour, we incur all the same expenses and may have turned others away; therefore, guests who fail to show for a tour, fail to arrive at the scheduled time, or back out of the tour will not be refunded the tour price. With at least 48 hours notice, you have the option to reschedule your tour. 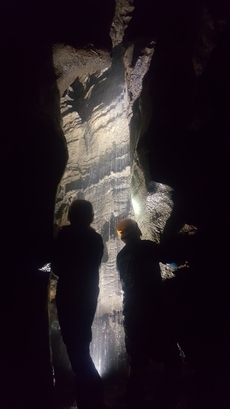 Our highly trained guides and staff strive to make sure that you will have a safe and memorable caving experience. If you have any additional questions or concerns that were not addressed in the above paragraphs, you are encouraged to contact us. We have extensive experience in caving and take thousands of people caving each year. 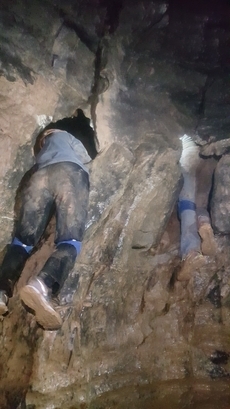 Our guides have a strong knowledge of the “dos and don'ts” of caving, which they will be glad to share with you.